Sea fishing is a very hazardous and exciting activity. In the seas the easiest way to catch the bull. For example, in the Black sea this fish is caught at any time of the year and bite at any bait of animal origin. Black sea goby — a small fish which is caught on any bait and tackle. The average size of adult black sea bull — 10-15 cm, and weight not more than 200 grams. Bull can to catch poplavochnoj a fishing tackle or by ground. Far casts are required, so the fishing will be successful both from a boat and from shore or the pier. As a fishing rod for sea donkey, you can use a regular spinning rod with a spinning reel. The optimum diameter of the fishing line for fishing medium-sized marine fish — 0,4 mm. The load for a donkey must have weight about 100 grams. As for hooks, to steer you can use large hooks, as small it will be too deep to swallow. Bait for catching bulls is any seafood: fish, marine worms, meat of a crab or shrimp, mussels, brine, snails, etc. Can be used and meat products, for example, pieces of sausage, sausages, cooked meat. Fishing technique steers the Donk is very simple. The tackle is thrown on a depth of 50 cm, after which the bite starts almost immediately. Bulls always grab the bait sharply and usually not off the hook, so complex sweeps is not necessary. At sea on a Donk can bite not only the bull, but any large fish, so it's best to constantly monitor bites and promptly removing gear from the water. Active biting of calves usually occurs in the morning until 12:00 and in the evening, when the time comes to a close. Goby is a carnivorous fish, however, he's not chasing prey and leads a sedentary lifestyle. So catching him is not required to use tricks such as posting and playing bait. Goby feeds on bottom invertebrates, young fish, eggs, larvae, shellfish and other foods of animal origin. This predator are usually hiding behind rocks and patiently waits next to him would be prey. 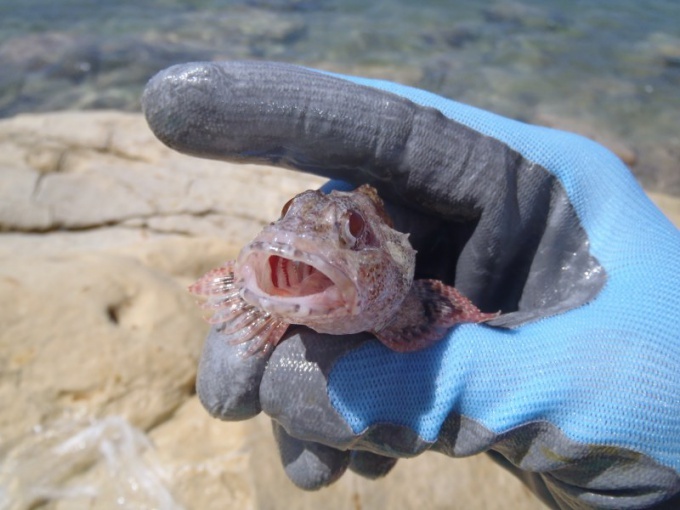 Therefore, a goby called a "bullhead". He can also dig into the silt and sand. Morning and evening, a bull searching for food near the bottom. On the sandy banks of the bull does not stay long, therefore, for successful fishing need to look for places with a rocky bottom and seaweed. Fish activity is usually observed near the piers and breakwaters, where, among blocks of stone bulls find shelter and make burrows. Best places for fishing are cleft in the breakwaters and the hollows between the ridges of rock.